.38 Special Dillon case expander? Well, I just got my new XL650, and I love it - except one thing. I'm loading .38 Spl HBWC and the expander that comes with the Dillon powder die just doesn't seem right. It opens up the case mouth but I can just barely start the bullet. When I was loading on my Lee press, I could push the bullet approximately half way down before seating it. Is it normal? Or are there aftermarket expanders that work better than Dillon's? Re: .38 Special Dillon case expander? Thanks, James, I check the seller's listings and I only saw the expander for .45. I sent him a message and asked if .38 expanders are also available. I just loaded 100 rounds and there was a lot of lead shavings there. Sent him another message asking the same. Maybe he will do a run for us? I have a dedicated 38 machine, but I could be a customer for my Dillon. let us know how it progresses. I just use a Lee disc measure mounted on my 550B. easier to make various size expanding inserts. Got a picture by chance ? I have heard something like this but don't quite follow. H load on a 550. Case bells enough to set the HBWC on and hold it on the way into the seating die. No lead shaving unless the bullet goes up sideways. That’s my fault. Multiracer wrote: Got a picture by chance ? I have heard something like this but don't quite follow. OK, folks, I guess my problem is elsewhere. I still use the factory Dillon expander, just adjusted it little bit further and now I can push the bullet a bit further before seating it. HOWEVER - I'm still getting a lot of lead shavings after the crimping station. 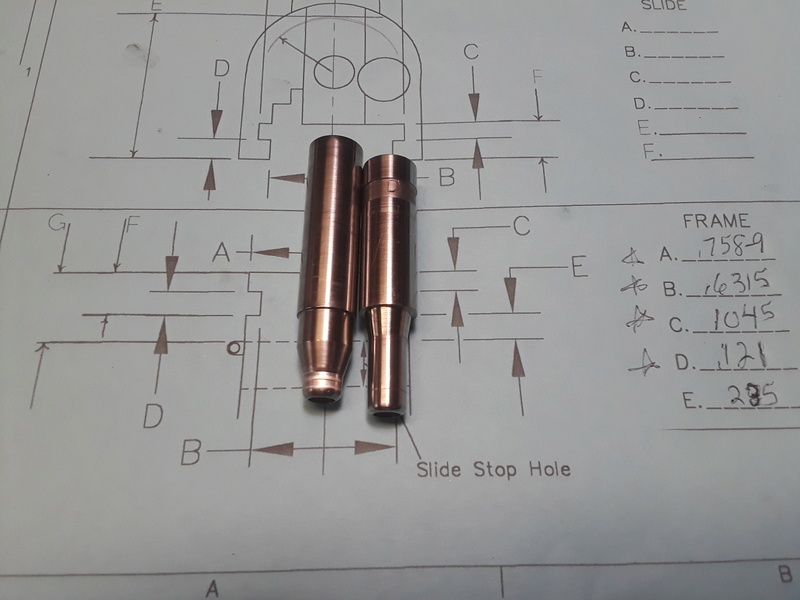 My crimp is .372 which is the same as the Remington factory ammo, but it seems like the Lee factory crimp die that I use crushes the top rim of the bullet. Any idea why that may be? Is .372 too much of a crimp? I also ordered seater and expander inserts from Uniquetek, maybe they will work better. As far as the Lee disk measure, I used it before and it wasn't very consistent. james r chapman wrote: With what powder. I find the Lee simpler and as accurate as the Dillon and much easier to adjust for various calibers and charges. But, that is why we have opinions. Hmm, ok, folks, it's getting interesting What I thought were lead shavings are, in fact, tiny pieces of dry lube that are squeezed out by the crimping. So no problem here. Still not happy with the expander though, I think I have too much of it, and getting some cracked cases. Tried to reduce it but having a hard time starting a bullet. I ordered the powder funnel from Uniquetek, hope it will solve the problem. What I didn't mention is that I use Remington bullets, apparently they have a slightly bigger diameter at the bottom than other bullets, like Zero or Magnus. javaduke wrote: Hmm, ok, folks, it's getting interesting What I thought were lead shavings are, in fact, tiny pieces of dry lube that are squeezed out by the crimping. So no problem here. Still not happy with the expander though, I think I have too much of it, and getting some cracked cases. Tried to reduce it but having a hard time starting a bullet. I ordered the powder funnel from Uniquetek, hope it will solve the problem. What I didn't mention is that I use Remington bullets, apparently they have a slightly bigger diameter at the bottom than other bullets, like Zero or Magnus. You need an expander for a .360 bullet. sizes about 1/2 the length to .360, 1/2 to about .357. I see, so there's really no option other than ordering a custom one, correct? I still haven't heard from the ebay seller you pointed me to. Are you dropping powder manually from that ? No, it has a spring loaded device much like the dillon does.